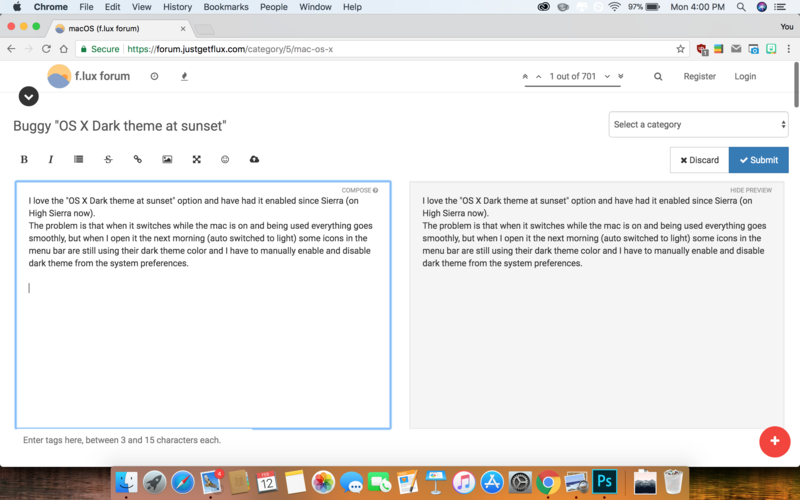 I love the "OS X Dark theme at sunset" option and have had it enabled since Sierra. The problem is that when it switches while the mac is on and being used everything goes smoothly, but when I open it the next morning (auto switched to light while mac is booting) some icons in the menu bar are still using their dark theme color and I have to manually enable and disable dark theme from the system preferences for them to use the right color. Presently, macOS 10.3.4 with Flux 39.984. Like you, my morning workaroud is to go into Preferences > General, uncheck the Dark Theme and then uncheck again.